BREAKING NEWS – In a landmark move, Apple has updated its developer guidelines to officially allow apps that transact in Bitcoin and other virtual currencies. This means that developers can now build iOS apps for Bitcoin wallets. And Coinbase, Blockchain, and Fancy can all return their apps to the store. Until today, Apple has not been a supporter of Bitcoin apps, and in the past, the company has rejected any app that transmits bitcoins. News apps like ZeroBlock and BlockStreet were approved for distribution in the App Store, but apps that traded Bitcoin like Coinbase, Blockchain and Fancy were rejected or removed from the store. These actions led to an uproar by the Bitcoin community in February of this year. Blockchain.info published a blog post called Blockchain’s Response to Apple, in which they said: “On Wednesday February 5th, Apple attempted to strike a devastating blow to the bitcoin ecosystem on iOS by removing “Blockchain”, the last remaining bitcoin wallet app, from the App Store.” The company criticized Apple for being anti-competitive and practicing censorship. “By removing the blockchain app, the only bitcoin wallet application on the App store, Apple has eliminated competition using their monopolistic position in the market in a heavy handed manner,” wrote Blockchain.info. There were dozens of articles that piled on this news, positioning this issue as a Bitcoin v. Apple deathmatch. One Bitcoiner even shot his iPhone with a rifle out of protest. Blockchain was not the only one impacted by Apple’s former policies. Coinbase, the popular US-based Bitcoin exchange, launched an iPhone app that was taken down by Apple after a few weeks. 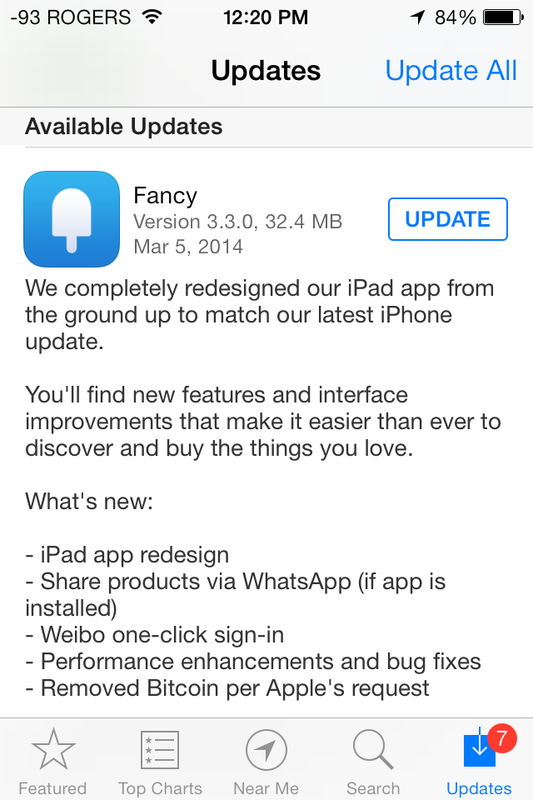 Popular iPhone app Fancy removed Bitcoin payments due to Apple’s request. It looks like this feud has come to rest. We are excited to see the innovation from Bitcoin entrepreneurs that will come to iOS.